Humintas al Horno. 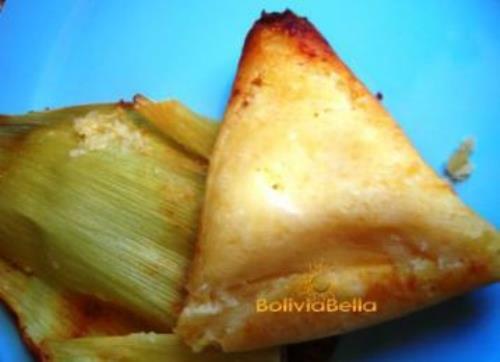 Baked Tamales. Bolivian Food and Recipes. 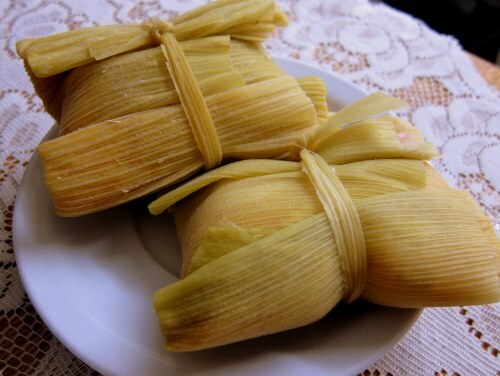 Humintas al horno are very similar to Mexican tamales only they are baked, not boiled. Also similar except that in Bolivia we don't make them with meat inside. There are two types of humintas: boiled and baked. This recipe is for baked humintas. corn husks (usually you can purchase these dried in Mexican stores in the US, otherwise try purchasing corn on the cob at a farmer's market and saving the husks - hang them up to dry them in the hot sun). Boil the corn kernels until they are soft (about 1 hours, up to 2 hours). Strain and grind the corn (either in a food processor, or with a little water in a blender - then strain the water off). You don't want to turn it into a completely smooth milky substance, you just don't want large kernels. It should be a thick, smooth paste. Take the whole dried chili peppers in your hands and break each one open. With your thumb slide the inside core (and seeds) out of the pepper. Break the pepper into little pieces or rub it between your hands until it crumbles. Do this until all the dried peppers have been completely crumbled. DO NOT TOUCH YOUR EYES OR FACE WITH YOUR HANDS - this may provoke an allergic reaction in some people and at the very least will leave your face and eyes numb and burning!! Wash your hand completely with soap and water after you complete this step. Place the crumbled chili peppers into a pan and fry them. They will smoke a bit, but don't let them burn. You just want to give them a smoky flavor. Add the anise, sugar and salt to the ground corn. Add the hot shortening and ground aji (dried chili pepper) and mix thoroughly. Wash the corn husks completely and fill each with a substantial amount of the prepared corn mixture, placing it in the center and leaving enough around the sides to fold the husk over two or three times. Place one or two strips of cheese onto each portion of corn mixture. Fold the corn husks over the mixture. Depending on the length and shape of the husks, you can fold them into squares, triangles, or rolls. The shape is unimportant. They don't have to be perfect. Bake at 350ºF (180ºC) for about 30 minutes (check your oven at 20) or until the husk begins to take on a golden color. You HAVE TO watch your oven closely at this point - the husk, if too dry, can begin to burn and may light on fire if you use a gas-lit stove. So take precautions. Use any hard, salty type of cheese. Goat cheese and sheep's milk cheese work well. In the U.S. there is a Mexican cheese called Queso Cacique that is very similar to what we use here. What you do NOT want to use is a white melty stringy cheese like mozzarella or American sandwich cheese or any other kind of creamy cheese. If you can't purchase white corn where you live, try 2-3 cans of hominy (totalling 4 cups). 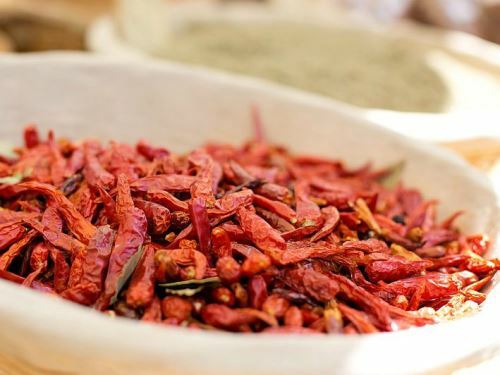 If you don't want to go through all the trouble with the peppers, replace the 5 tablespoons of dried yellow chili pepper with only 2 tablespoons of powdered yellow chili pepper (you can use red chili peppers too, but the red ones are WAY SPICIER so adjust according to your taste for spicy foods). And by the way, when dried (dehydrated), the whole yellow chili peppers take on a dark RED color - so be sure to purchase the correct ones at the store and read the label carefully. Humintas are generally NOT SERVED SPICY. The yellow chili pepper just gives it a special flavor, it doesn't make them hot. If you use red chili pepper, it will most likely be spicy.